This week Fawnskin was invaded, like it is every year, by Ladybugs. I noticed a bunch of flying insects off my deck on Tuesday and thought it was odd and then on my walk on Wednesday I was surrounded by clouds of the little insects down near Grout Creek and in Miller Park. 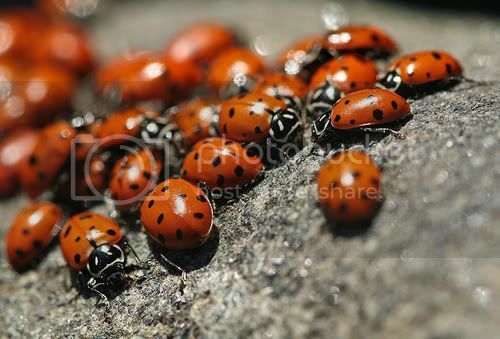 The Ladybugs appear annually in the spring–so it is a bit late but they are here once again. These insects are found worldwide and it is estimated that there are 450 native variations to North America alone. Ladybugs are called Ladybirds in other countries and are most known for their role in feeding on aphids or scale insects that damage gardens, agricultural fields, orchards, and similar places. Harmonia axyridis (or the Harlequin ladybug) was introduced into North America from Asia in 1988 but is sadly out-competing many of the native species. Curious folks can learn more about Ladybugs here. The origin of the common name of Ladybug is not clear but lore reveals two stories. In more the ancient days of agriculture, farms were vulnerable to insects that killed the crops. When farmers began praying to the Virgin Mary for help, shortly after, the little beetles flew in and killed all the insects that were eating their crops. The red color of their wing sheath was taken to represent the Virgin Mary’s cloak with the seven black spots representing the Virgin Mary’s seven joys and seven sorrows. The book, History of the Ladybird allegedly cites 329 common names and over 80 refer to the Virgin Mary with an additional 50 references dedicated to God. In this religiously linked version of the story, to honor the intercession of the Virgin Mary, the beetles were called, “lady’s bugs” which morphed into Ladybugs. The other legend is supposed to have originated in Medieval England where farmers would torch their fields after harvest to clear them for the next planting. The English version of the rhyme is thought to have originated circa 1744. 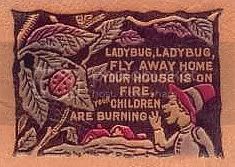 The superstition surrounding the Ladybug was that it was bad luck to kill them and the poem was thought to be a warning to the aphid-eating Ladybugs still crawling the vines and the about the immobile pupae (Anne) that remained fastened to the plants (laces) and couldn’t escape. You might have noticed the new banners over at North Shore Trading Company referencing Big Bear Fishing Adventures Spin & Fly Fishing Shop. Mike & Susan Tuttle of Big Bear City have moved their store into NS Trading Company and also offer services as fishing guides. 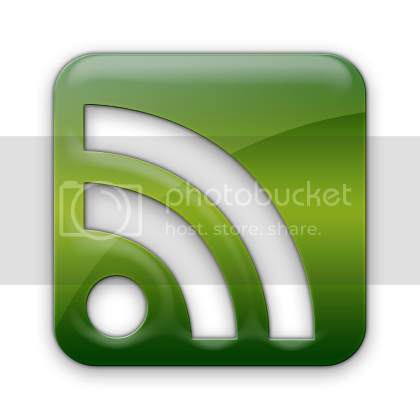 If you are curious you can view their website here. Paving projects have dominated the parking lots at both sides of Fawnskin. You’ll be happy to hear that the Post Office parking lot is completed and open again. They were supposed to pave over the weekend but somehow it was delayed and so inconvenienced locals during the early part of the week. On the East end of Fawnskin, the North Shore Tavern also is sporting new black top. Also on this end of town the DWP is taking down healthy trees to move their pump house onto Seminole. Finally, if you have dropped into Fawnskin Market in the afternoons you will have met Melissa. It seems that Mike is taking the afternoons off now–which is long overdue considering his seven days a week work ethic. This weekend is going to be another busy one in the valley because there are a lot of events including Music in the Mountains, Corvette’s West Big Bear Bash, the Big Bear Gathering Fundraiser “Wine, Whiskey & Chocolate,” and the 7th Annual Carp Roundup. This entry was posted on Friday, June 25th, 2010 and is filed under Business & Commerce, Events, Mountain Lake Resort.